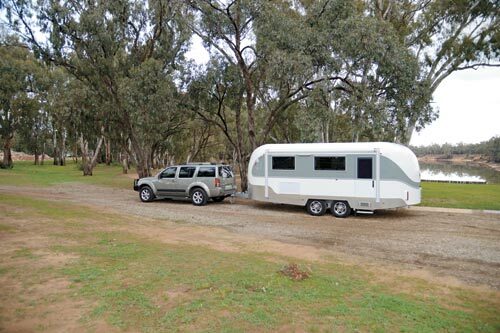 Alistair and Geoff Morrison of Echuca, Vic, had little experience with caravans before deciding to build their own: the Aerovan aerodynamic caravan. They were both into ultra-light aircraft. The first Aerovan had a G&S painted steel chassis topped with a 19mm-diameter steel body frame. 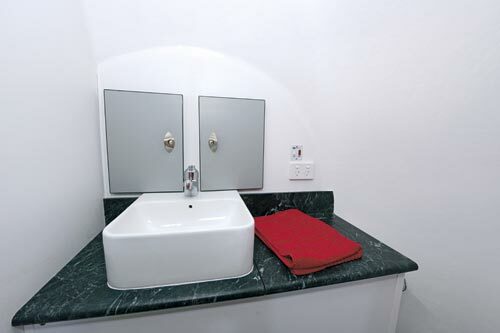 Flat walls and a flat roof were created by gluing and screwing 3mm fibreglass to both sides of the frame and filling the cavity with polystyrene foam. But while somewhat radical in appearance, the prototype was still built like a conventional frame-and-cladding caravan. It was with the second iteration of the Aerovan that things started to get interesting. The steel frame was considered too heavy and old fashioned, so the Morrisons eliminated the frame and replaced it with a monocoque construction of 39mm-thick walls, roof and floor, consisting of 35mm of foam sandwiched between 2mm of fibreglass on each side. 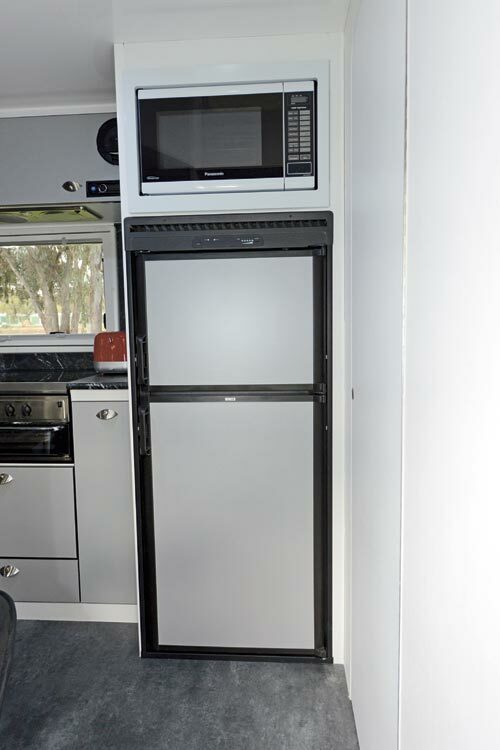 Graystar Trailers of Melbourne was engaged to create the panels and wooden blocks were incorporated in areas that needed screw fixings, such as door jambs and the location for the swivel arm for the television. And, this time, the fibreglass ends of the van were double-skinned for added strength and to stop light shining through. 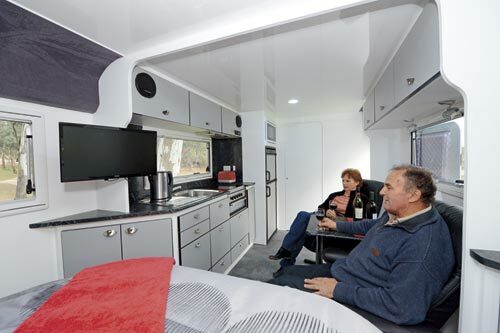 Apart from simplifying the building process, the new construction saw a dramatic drop in weight to just 1650kg Tare – not bad for a fully-featured caravan on a galvanised steel chassis with outer body dimensions of 6.5m (21ft 6in) long and 2.4m (8ft) wide. 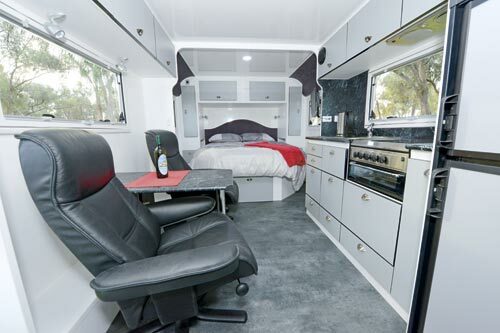 The Aerovan is a roomy caravan in its layout, which consists of queen-size north-south bed up front with lift-up storage below, a large kitchen on the offside, and a large, separate ensuite in the van’s tail. The second prototype we reviewed was already promised to a friend, so it was equipped with his preference of two large swivelling armchairs instead of a conventional lounge or café-style dinette, but the van’s design allows any of these formats to be incorporated, depending on customer requirements. 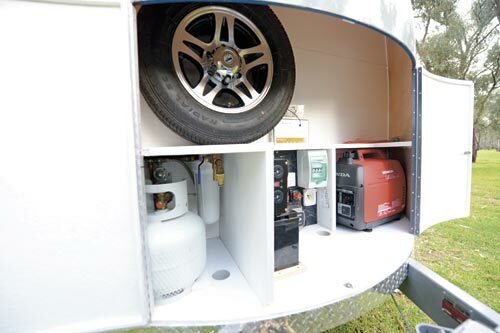 The nose opens via double checkerplate-clad barn-style doors to reveal a vertically-mounted spare wheel, a single 120Ah deep-cycle battery, a 2000W inverter, a Ctek power management system, a 2kVA Honda generator, and twin 9kg gas cylinders. 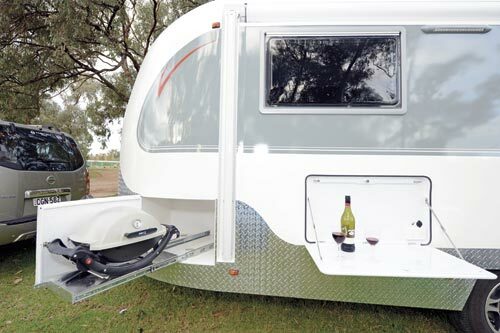 There’s a huge storage hatch on the offside that would accommodate large folding chairs and tables, and a Weber Baby Q slides out of the opposite locker on the nearside. 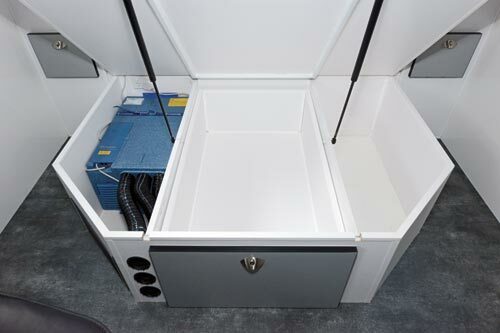 Because it’s made completely of fibreglass, the van’s structure and strengthening bulkheads incorporate a myriad of cupboards (all with full piano hinges for strength) inside and a copious amount of drawers. So you want an Aerovan now? Well, you might have to be patient. 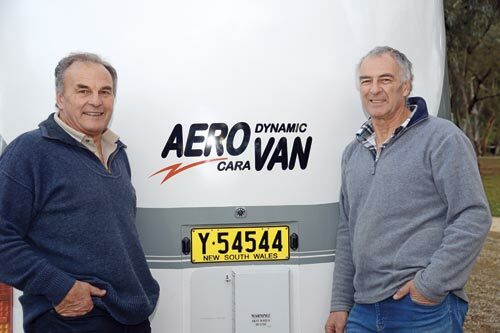 Now both in their late 60s, Alistair and Geoff Morrison believe they are getting too old to become serious caravan manufacturers, so they are looking for an industry partner to take their Aerovan to the next level and into production. To see it in production!